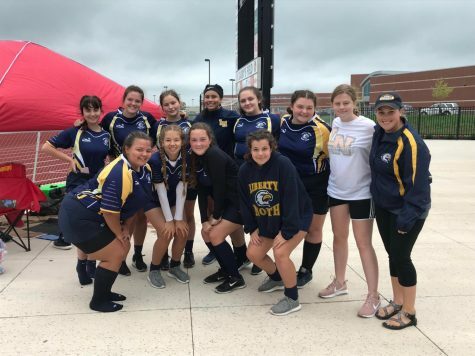 Girls Rugby is rucking over all of the competition; with their record of 2-0, they are on the road to state. This weekend they had a match against last year’s state champion. “I wasn’t expecting us to be so good because we lost so many seniors but we are going really good,” junior Jami Parker said. The state champions went undefeated last season and beat the Lady Eagles every time. “It’s scary but I feel like we will come out with the win, our backs are really good at running up and they are really fast,” freshman Lily Brancato said. The girls also have a game against NKC Snow who they have already beat this season during a non-league game. The girls beat the NKC team 27-0. “The team looks good and we are getting better as we go, the strongest part of our team is how well much we want to get better every day,” freshman Tamia Eubanks said. The girls went on to beat Independence 12-14 and beat NKC Snow 35-7. The girls continue their undefeated streak. The girls have another tournament Oct. 6th down in Jefferson City. They are planning many routes of improvement so they can get that state title back. “We are wanting to improve on kickoffs and making sure we are catching in the air and fitness so we can run the whole 7-minute halves, I have a feeling the state title is coming back to North,” Parker said.